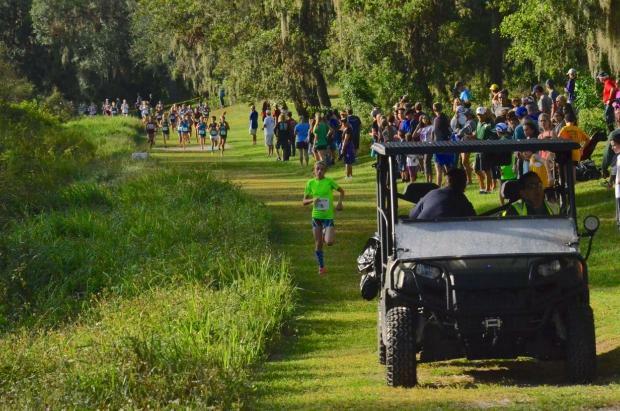 The 2017 FLYRA Middle School State Championships opened up on a cool October morning at Holloway Park in Lakeland on Saturday. The meet has evolved since 2010 when it was held at Sun & Fun and just 450 young athletes showed up. In 2012, the meet got the privilege of moving to Holloway, a private park just off US 98. 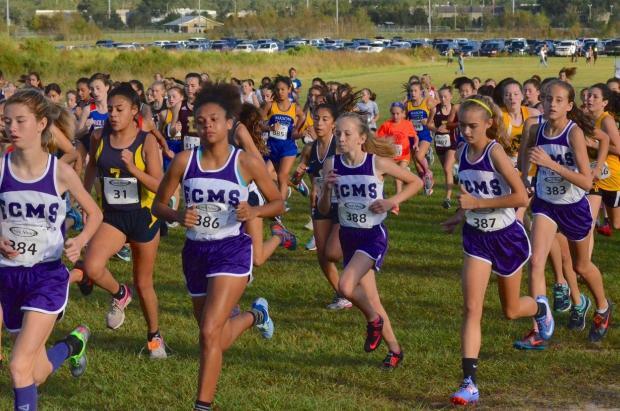 Over 1,800 competitors laced up for the meet, divided into championship and open races, and the elementary school competition. "Our first year at Holloway 750 kids were here, it's just kept growing after that," Meet Director Laura Fredrickson said. The morning started with all eyes on the fluorescent green shirt of Abraham Lincoln Middle School's Ani Veltcheva. Veltcheva set the course record at Holloway last year as she won it in 10:38.67. She pushed out to an early lead and found no challenges. Even coming around near the one-mile mark, she had left any trailing runners in double-digit deficit. She nearly caught the pace vehicle. "I didn't like the cart being so close, I could smell the fumes, it was way too close," Veltcheva said. 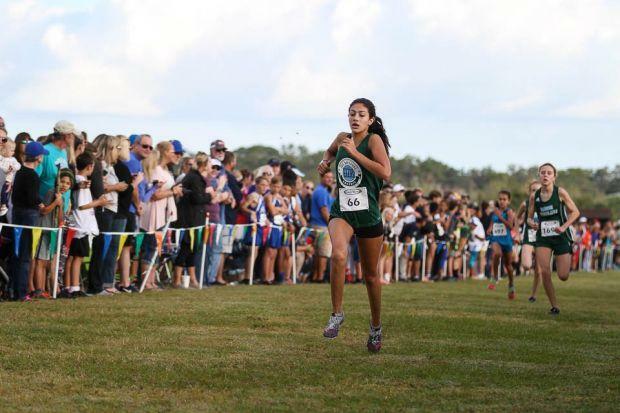 Veltcheva set her 10:50 regional qualifying time at Disney and had a chance to improve on her own course record. She did just that, clocking in at 10:37.59. "All the other girls ran really fast for me to win, it makes me really happy," Veltcheva said. Veltcheva has a bit of history at Holloway Park, even being just an eighth-grader. 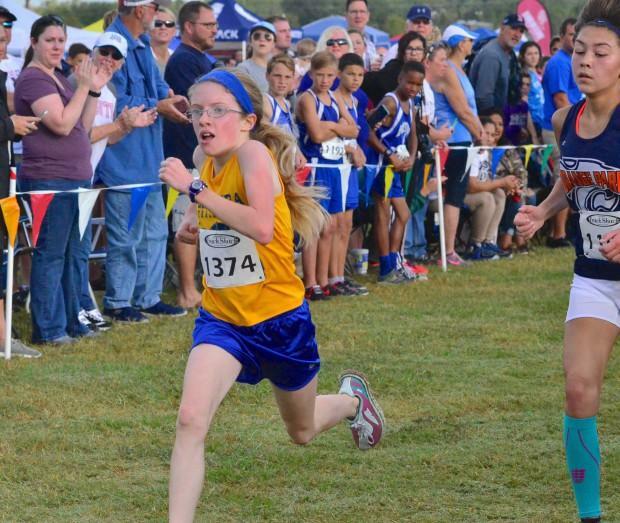 As a fifth-grader, she placed 10th in the middle school state meet. As a sixth-grader, she took ninth place and Saturday marked back-to-back titles. Beyond Veltcheva there were some great battles. Sixth-grader Rory Claussen fought with the trailing pack and found herself in a finish line duel with Orange Park Junior High's Mei Chiang. The longer-legged eighth-grader looked to be the favorite for the finish line sprint but Claussen fought her off. "She (Chiang) passed me, I passed her back and it was on," Claussen said. "I was so tired, I just wanted to finish and get past her at the end." 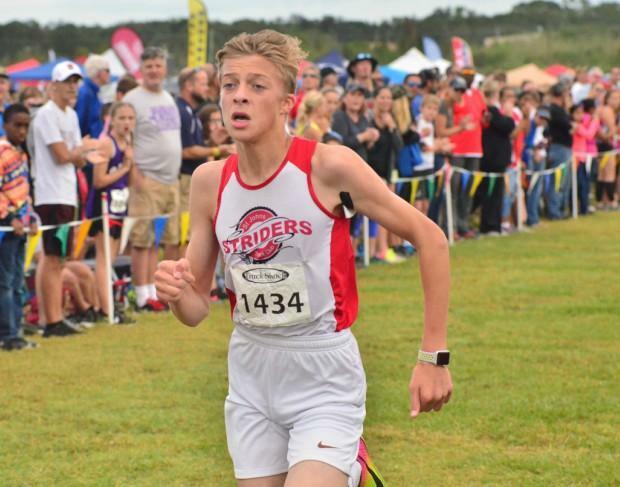 Claussen is new to cross country. She competed in the 3,000m in track and even made the middle school national meet in Michigan. She enjoys the complexity and diversity of surface and elevation in cross country. 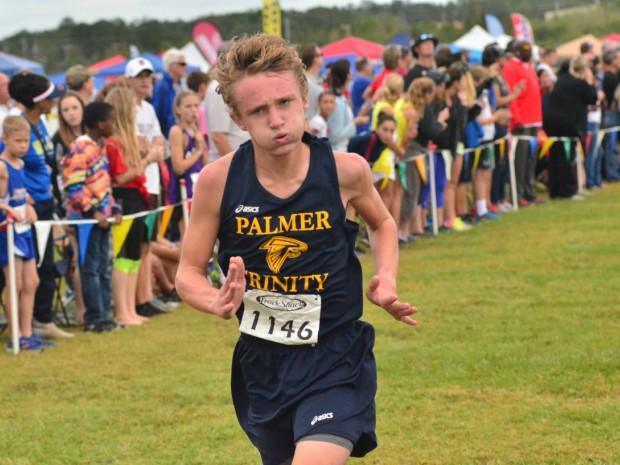 "I ran some high school open races in Panama City, it prepared me for this course," Claussen said. Claussen and Chiang both set new personal records, Claussen an 11:21.77 and Chiang an 11:22.63. "I run against her (Veltcheva) in almost every race this year, I just try to get closer to her," Chiang said. 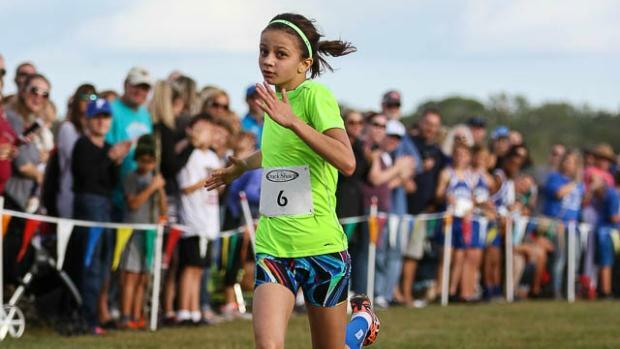 Fourth-place runner, eighth-grader Arlie Rubin of Bayshore Project also set a new personal record of 11:27.38. "These girls are great competition, Ani is just in a league of her own," Rubin said. "All these girls have such great sportsmanship." Rubin's older sister Alix runs on the Plant high school team that just won the Class 4A District 6 title. Rubin's teammate Mary Ellen Eudalay, who placed sixth, also has an older sister on the Plant varsity team. Both runners are set to bolster the Plant program next season. 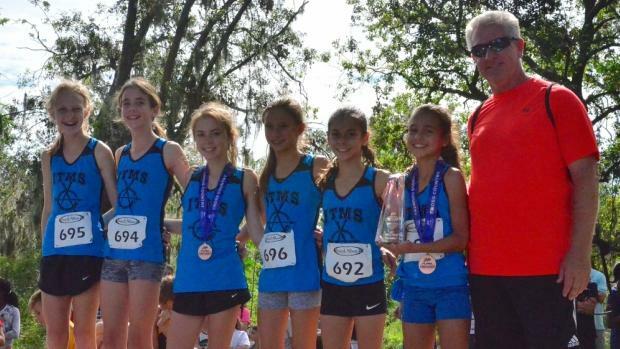 Indian Trails, led by sixth-grader Jolynn Rodriguez (6th in 11:27), unseated Tavares Middle School as the middle school team champion 62-88. "We were open division champs last year and we lost five runners off that team," Indian Trails coach John Riegelmayer said. "For the team to come back and win this year was big." Riegelmayer's group is young, just one eight-grader and it was his younger athletes that helped carry the day. "(Rodriguez) really stepped up today, our number one runner ran sick today and Rodriguez stepped up and took her place and ran a PR." The boys race left a bit more to be settled on the trails. Rheinhardt Harrison, George Stark and Tristan McWilliam all packed together as they came through the one-mile mark, a five-second gap opening up on the rest of the runners. A melee on the trails saw Harrison emerge in front and it would be Harrison to hold on for the win in 9:43.91. "I passed the first guy going up that first hill (near one mile), then it was me and Stark," Harrison said. "Then there was another hill, I sprinted up that one and got Stark. When I came out from the woods, I knew I had a decent lead and there's a spot on that curve to take a look back. Once I did that, I knew I had a good chance to win." Harrison won it, setting down the previous course record of 9:48.30. 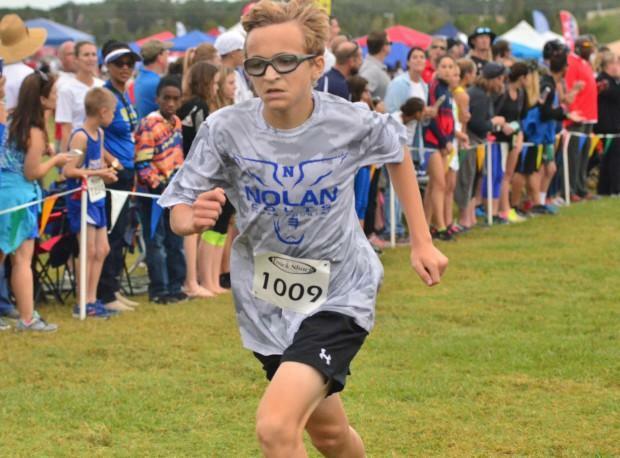 Stark, in pursuit of Harrison, set a new personal record of 9:53.02, the fourth-fastest time for middle school boys on the course. "I was basically trying to stay with that lead group and using them to help keep me going until the end," Stark said. "I had heard of McWilliam from the website and I stuck with him, testing him." McWilliam took third in 10:06.13. McWilliam has a 10-flat to his credit this year but he ran a 10:22 at Holloway for the Flrunners Invitational just a few weeks ago. While falling out of the lead, that time slash was redeeming. "That pressure from the other runners had a lot to do with it (10:06)," McWilliam said. 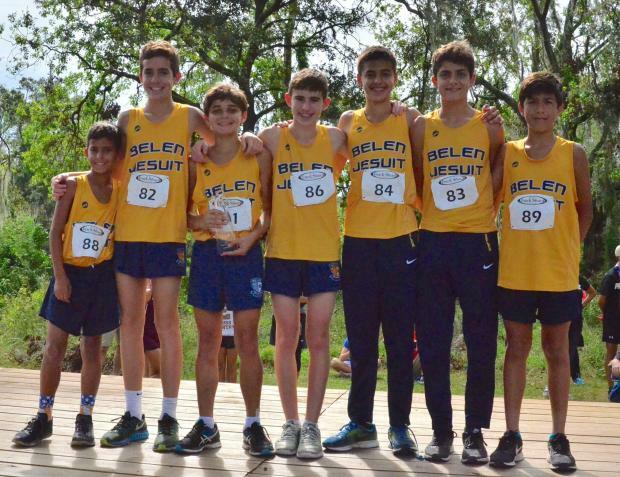 The Belen Jesuit boys pushed past defending champs Tavares 89-157 without an individual runner in the top 24 spots. They got it done platoon-style with just 18 seconds separating the top five runners. "They've been running like that all year," Belen Jesuit head coach Victor Arrieta said. "They all depend on each other and do their jobs, if someone is down, someone else will pickup the slack." 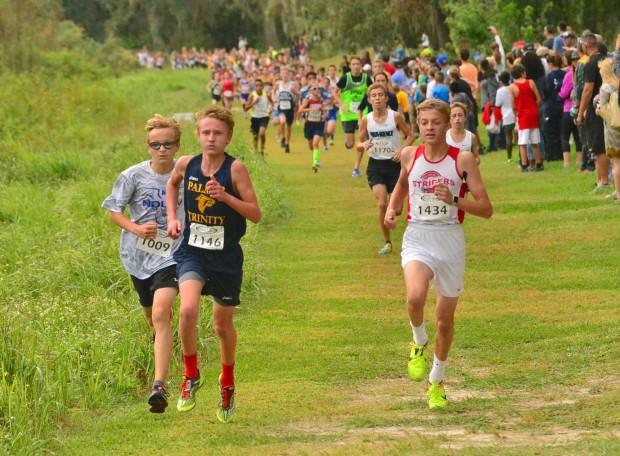 Thomas Duque and Joshua Ruiz led the way in 25th (10:40.5) and 27th (10:43.55), respectively. "(Ruiz) is just a sixth-grader, he usually runs with just the other sixth graders or on JV, today was just his second time up on the middle school team," Arrieta said. "Our eighth graders have good leadership, they tell all the other kids what they need to do. We're fortunate to have the kids we have."